Heerema Marine Contractors, Eneco and the Port of Rotterdam Authority have signed a Memorandum of Understanding to jointly perform a feasibility study on the creation of shore power infrastructure in the Calandkanaal. The MOU represents a major step towards developing a Shore Power Connection in the Calandkanaal (SPCC) and to provide Heerema’s fleet with sustainable power inshore. The parties have created a consortium to explore the opportunities and are looking for marine partners who are willing to co-accelerate the energy transition. The main objective of the consortium is to perform a feasibility study to realize a shore power connection in the Calandkanaal, providing sustainable power for offshore vessels. The order of magnitude of the connection is 20MVA. It is envisioned that large offshore vessels, while moored at the Calandkanaal, will be fully powered by green electricity while operating inshore. The use of shore power for moored vessels at this scale is an industry first in the world. Connecting Heerema’ s fleet to the grid by sustainable energy will provide a significant reduction in terms of emissions and noise. Due to the fact the diesel generators will be switched off shortly after the vessel is moored, nearly all emissions – CO2, NO¬X, SOX and PM – will be eliminated in the channel. In addition to the emissions saved, noise generation will be reduced significantly too. In the future, more vessels could be connected to the grid to further reduce the (carbon) footprint. Naturally, this is pending the outcome of the feasibility study. Despite many challenges, all parties have a profound drive to make this development a reality. During the signing ceremony at the Port of Rotterdam, the parties highlighted the sustainable potential for the region that this project brings. Yvonne van der Laan, VP Industry & Bulk Cargo Business of Port of Rotterdam Authority, opened the ceremony with the words: “The energy transition coalition is high on the agenda of the Port of Rotterdam. This feasibility study for green shore power is a potential big step in making the infrastructure of the Port of Rotterdam more sustainable. It is a positive development that this is done in a consortium with Heerema, Eneco and the Port of Rotterdam. The energy transition requires many steps to be taken, with many partners to accomplish. Katja Langen, Director Business Development of Eneco expressed that “Eneco would very much like to determine how green wind energy, produced on location, can be coupled with shore power solutions. Potentially, mobile energy solutions could be developed. The answers on how to achieve this exactly, and the challenges this project brings, will have to be thought of in cooperation with Heerema and the Port of Rotterdam, together. 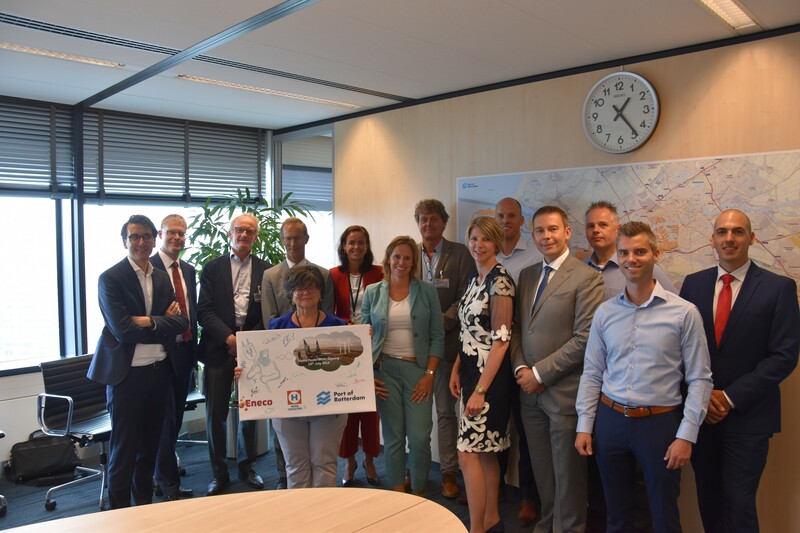 Heerema, Eneco, the Port of Rotterdam and other partners in the consortium will jointly pursue additional partners and subsidy/grant providers that can assist and facilitate in this feasibility study phase. The addition of other marine partners who are interested in mooring in the Calandkanaal could potentially be beneficial to the development of shore power in the Rotterdam area, as risks will be reduced for all parties involved. Heerema Marine Contractors is a world leading marine contractor in the offshore industry with a history of excellence in project management and engineering. Its passionate workforce and fleet include heavy lift, renewables construction and decommissioning vessels, which have been active in the North Sea area for almost fifty years. Since then, Heerema’s base of operations has been the Calandkanaal, used for the preparation of its activities in the North Sea. As a responsible contractor at the forefront of the energy transition, Heerema is takes the lead in reducing its footprint and environmental impact of its activities and remain a role-model in terms of sustainability. Heerema is investing in the necessary means to convert its vessels Thialf, Sleipnir and Aegir to accommodate this shore power connection subject. The willingness of this development clearly shows that Heerema believes in a commitment beyond just compliance, in which it is already heavily invested as demonstrated by the use of LNG engines in its new-build vessel Sleipnir. Eneco Group is a group of companies active internationally in the field of renewable energy and innovation. Together with their customers, partners and over 3000 employees they work on their mission: renewable energy for all. Eneco develops, builds and operates assets for sustainable energy generation and storage. Further, it serves more than 2 million business and residential customers and carries out energy trading activities. It is Eneco’s ambition to bring its own energy consumption and that of its customers to within the planet’s limits, in order to ensure that our planet remains livable in the years ahead. Eneco intends to deliver sustainable shore power as a service according to jointly agreed specifications. Eneco will therefore – per development stage - coordinate all feasibility and explorative engineering studies on the shore side of the connection that are necessary to complete the feasibility of the Shore Power Project. Eneco will act as an aggregator including the assessment of potential subcontractors and technology providers on the shore side of the Shore Power Project. The core tasks of the Port of Rotterdam Authority are to develop, manage and run the port in a sustainable way and to maintain a speedy and safe service for shipping. The Port Authority aims to strengthen the competitive position of the port of Rotterdam as a world-class logistical and industrial hub; both in terms of scale and quality. As a prime mover in the energy transition, the Port Authority intends to play a pioneering role and make the port an inspiring example for the global energy transition. Port of Rotterdam will take a supporting and matchmaking role in the development and construction of the required infrastructure and in this role will explore how an attractive business case can be developed by attracting additional users of the SPCC facility. This role pertains activities such as a location study, facilitation of possible subsidy applications, the exploration of land lease options and the identification of potential additional users of the shore power connection within the limits of privacy laws and legislation.